School Hours: Classes are held from 8:00 a.m. to 4 p.m., Monday through Friday, all levels. Parents must sign in their child at the back door. Please drop off your children at the back door, unless instructed otherwise. The Gates open at 7:50 A.M. Before 7:50 A.M., children are not supervised inside school and rooms remain closed. Parents should plan enough time to say goodbye to their child at the back door and allow the child to walk in, alone, to the common area by 8:00 A.M. Teachers will gather the children, promptly, at 8:00 A.M. and are expected to start class on time. Drop off & Dismissal: Parents must sign in/out their child at the back door. Parents arriving at the school after 8:00 A.M. and/or 4:00 P.M. must enter and pick up their child at the reception through the front door. There is a $15/ per 10 minutes/ per child charge for children who are not picked up by 4:00 p.m. Drop off cannot be earlier than 7:50 a.m.
*Please note that drop off can be earlier on testing/competition days and the parents are notified for an early drop off for testing. Testing & competitions are scheduled during the month of May and June. After School Care: After School Care is from 4:00p.m until 5:30p.m., for $150-$200 per month, depending on the grade of the child. There is a $15/ per 10 minutes/ per child charge for children who are not picked up by 5:30 P.M. After School care fees may be drafted via ACH drafts along with the tuition, per parents’ request. Please see the office to allow the drafts. Payments made by checks must be submitted before/by the 5th of each month by noon. A late fee of $35.00 will be charged for missed payments. After two missed payments, a child may be dropped from the after school care program. Backpacks: Since we encourage a child to carry all his/her belongings in the backpack, we would like to remind the parents that when choosing/purchasing a backpack for your child, to keep in mind that the backpack must be able to include your child’s lunch box, and fit the size of the school cubby. No backpacks with rollers please. Cubby width 11¼” and Depth 12″. Please label your child’s lunch box, bottle of water and backpack with the child’s initials or name. Preschoolers: A daily change of clothes must be added in the child’s backpack, in large ziploc bag, including underwear and socks. We recommend leaving an additional pair of shoes at school in your child’s basket. A small blanket and a small pillow are required for the children’s nap. Lunch Period & Recess: Students must bring their lunch to school unless planned otherwise. A reminder, that if lunch time is to be a relaxation period, then general cleanliness and good conduct must be followed. A clean-up effort is organized each day by each teacher to keep the lunch area clean for the next class. Students are encouraged to respect the playground rules or necessary disciplinary action will be taken. Parents will be called upon for repeated disregard of the rules by their children. Homework Help: Students eligible for homework help in French must be signed in for the after school care program to allow teachers to help the student after hours. Homework help is at the discretion of the Director. Please note that homework help is not a tutoring session. Teachers help answer questions only. Days of homework help varies depending on fall or spring semester and the needs of each school year. Friday Performing Arts & String Program & Extracurricular Activities: Many after school activities round out the students’ cultural learning, allowing them to fully develop physically, artistically and intellectually. The school offers now the Friday Performing Arts & Music Program. Students attend their mandatory string program and all performing arts classes on the same day. The performing arts program day may include also other extracurricular activities. Friday classes, subject to change, include drama, modern dance, singing, yoga, psychomotricity, PE, and/or chess. If extracurricular activities are offered outside of the premises, parents are notified in writing. Most of the activities are taught by EJJR instructors. if a class is taught by an outside instructors fees & charges may apply; and if applied, parents are billed separately or asked to pay directly the instructor. Some school years, EJJR cannot offer additional extracurricular activities based on parents demands, staff needs and availability. Students are required to wear the appropriate attire on Fridays to participate in the different performing arts and PE classes. PE/Yoga outfit is mandatory on those days. The dance outfit is provided for the children by the school. Dance shoes must be provided by the parents. Dance outfits are taken home on Fridays to be washed ans returned to school on Mondays. A child without a PE attire, a dance outfit or shoes, including tennis shoes, will not be able to attend these classes. Chess: French or English – By outside instructor, separate fee applies. Soccer: English – By outside instructor, separate fee applies. Private Guitar Lessons: English – By outside instructor, separate fee applies. Private Voice/Piano Lessons: English – By outside instructor, separate fee applies. Absences: It is required of students to regularly attend all classes scheduled for their grade, as well as, the activities chosen at the beginning of the year. Punctuality is a primary rule to observe. We must be informed of any absence by 9:30a.m. that same day. After 3 consecutive days absent, the student must provide a medical certificate attesting that the return of the student involves no contagious risk. All absences , late drop off, or early dismissals due to a medical appointment must be accompanied by a doctor’s note with the date and time of the appointment. Tardiness: Guardian must call or send an email if running late and arriving after 8:10 a.m. to allow us to open the front door to the student upon his/her arrival. The parent must drop off the child at the reception through the front door and sign in the child with the time of the child’s arrival. A staff member will accompany the child to his/her classroom. Please note that frequent tardiness disturb class and affect your child school life. In some cases, frequent tardiness might lead the disciplinary action. Parking: Parents can park in JJR parking lot on both sides of the gate. They are asked not to park in the driveway, in front of the gate, or use their car horn or double park. 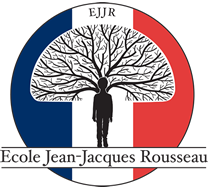 Dress Code: At this time, no school uniform is required at Ecole Jean-Jacques Rousseau. Students must come to the school in proper attire. If any of the basic rules are not observed, we reserve the right to refuse entry to any students. Conduct: A polite attitude and use of proper language are expected from students towards all school personnel, their friends and any person met in the school or its immediate area. Respect for the school property: Students must be responsible for the cleanliness of the school (picking up in the classrooms, corridors, bathrooms, etc.) particular attention, starting at the youngest age, must be given to respecting school furniture, property and supplies left at the disposal of students. Damage done intentionally to the grounds, walls or due to the improper use of equipment may lead to disciplinary action, and parents will be held financially responsible for repairs. Students must keep track of their belongings (books, clothes, lunch boxes, etc.) and not let them lie around in the hallways. Parents are strongly advised to put name tags on all their children’s belongings. Lost and found items must be claimed. The Programs cannot be held responsible for the exchange, loss or theft of objects or money belonging to students. For safety, hygienic or disciplinary reasons, it is forbidden to smoke inside the premises or in its immediate surroundings, to chew gum , to bring any valuables, as well as, any items which could be dangerous, to use in the school any item not required by school activities (radios, magazines, walkman, video games, iPad and cell phones). Students are reminded that the use and possession of drugs and alcoholic beverages are strictly forbidden, as well as, sexual harassment and violent behavior. Students found committing an infraction will be subject to the punishment prescribed by Texas State Law.